Achieve exceptionally high filtration efficiency with low air restriction. Complete selection of filter panels solves even the most difficult problems. Type DH Panel Housing Assemblies offer modular shapes and sizes for every need. The Modular Concept of the “DH” panel assembly, sometimes called the “dog–house”, provides for a wide range of diversified applications. 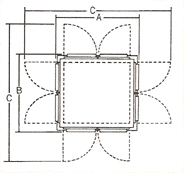 Six basic designs are shown here. But modifications can accommodate any special requirement. Falls Filtration “DH” assemblies are designed to assure maximum efficiency in protecting equipment from harmful dust, dirt and grit. Filter large volumes of air economically. And they are constructed to provide easy access for servicing. Large DH assembly with panel removed for servicing. Note expanded metal guard behind filter. 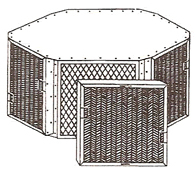 “DH” assemblies are constructed of heavy gauge steel and are equipped with individual holding frames for filter panels selected. These sturdy frames utilize spring-loaded clips to hold panel firmly against sealing gasket. All panels are supplied with lift handles for loading and removal of panels during servicing. Filter panels may be removed for servicing while equipment continues to operate! 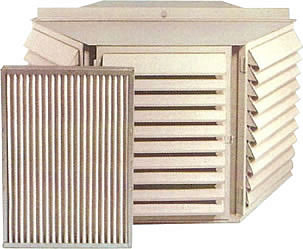 Because an expanded metal guard stands behind the filters to prevent large objects from entering the exposed air intake. Swing out louvers, for protection against rain or snow, are included when “DH” assemblies are ordered from table on page 3. Louvers are hinged for easy access to filter panels. Mounting bases may be flanged or square. Designed for air compressors, blowers, engines and other industrial uses, Falls Filtration “DH” assemblies may be installed at any point where clean air is required. They may be mounted on air intake pipes that accept a 125 or 150 lb. American Standard Flange with welded studs to match bolt centers. Air capacity requirements govern the number of filter panels used, as well as the final size of the assembly. Type P5 filters in 2” or 4” thicknesses are standard equipment on 2DH and 4DH assemblies. Other types of panels are also available.